If Higgs Boson Calculations Are Right, A Catastrophic 'Bubble' Could End Universe : The Two-Way Based on what we think we know about the Higgs boson, an alternate universe could wipe out ours. Our universe, now, the scientists explained, is at the precipice of stability. According to Discovery News, Lykken said if this happens, it'll happen at light speed, which means if anyone is around to witness it — our solar system will be long gone — they'll be gone before they realize it. 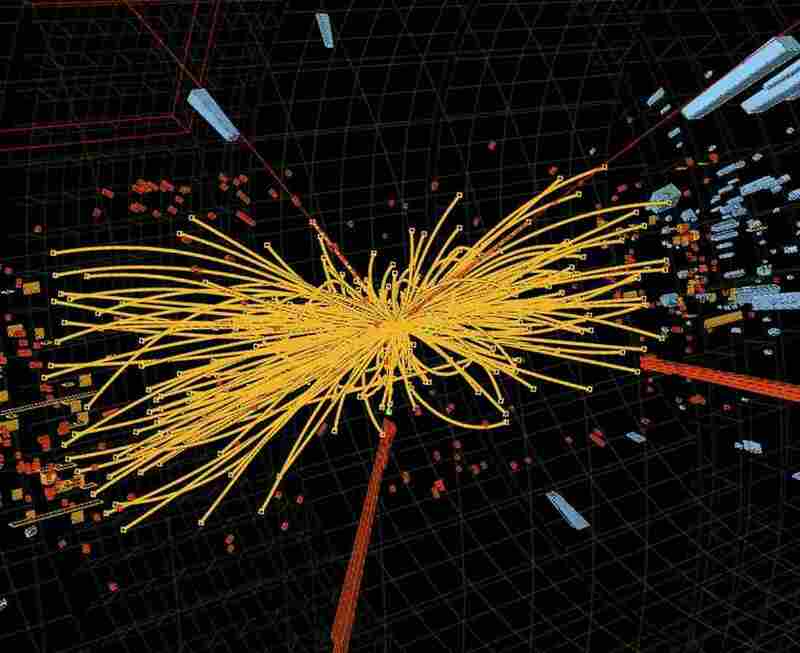 Now, all of these calculations use what we know about a subatomic particle discovered by CERN back in July, which scientists said bears the hallmarks of the Higgs boson. 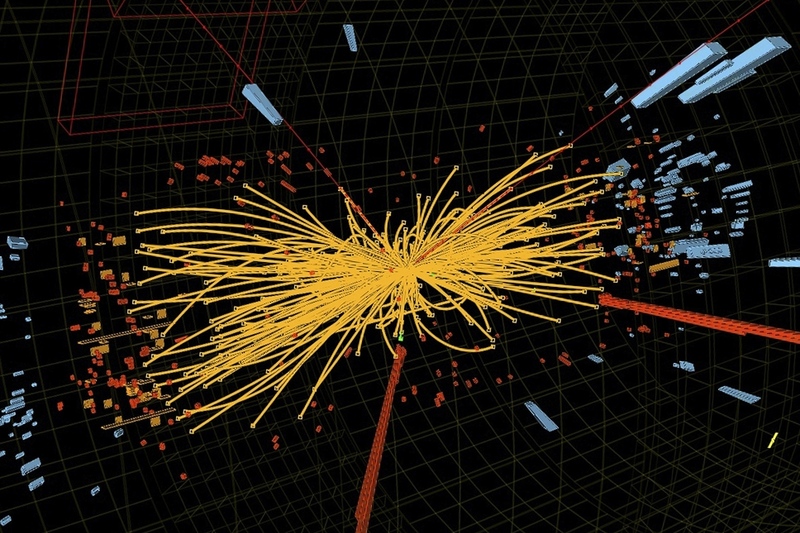 As we've explained before, scientists believe the Higgs is the thing that gives other subatomic particles their mass. We won't know more about the Higgs for a while. The New Scientist reports that Large Hadron Collider, where the Higgs-like particle was discovered, has gone into a two-year hiatus. Scientists will make tweaks to the atom-smashing machine and it will reach peak energy in 2015. Update at 6:24 p.m. ET. At Any Moment! Of course, this gets weirder. Two of our very smart readers (j m and Sean McElroy) point out that our universe is billions of light years big. "You wouldn't want to be standing next to a 'bubble of true vacuum,' that would be immediately fatal, but if it's far enough away, you'd have time to, well, fall prey to any of the myriad other types of death," Sean writes. We asked Fermi Lab's Lykken about this observation. He said it was correct. "The bubble forms through an unlikely quantum fluctuation, at a random time and place," Lykken tells us. "So in principle it could happen tomorrow, but then most likely in a very distant galaxy, so we are still safe for billions of years before it gets to us." Our friend Marcelo Gleiser, a professor of physics and astronomy at Dartmouth College, explained back in January that this is the rub with this theory. If true, we should be able to "see" a "neighboring" universe. We won't be able to see the destruction a collision would bring because both the light (image) of it and the destruction itself are moving at light speed. "Just as with soap bubbles that vibrate when they collide with one another without popping [emphasis ours], if another universe collided with ours in the distant past, the radiation inside our universe would have vibrated in response to the perturbations caused by the collision. These perturbations would be registered in the cosmic radiation and could, in principle, be observed. Matthew Kleban from New York University and his collaborators, and Anthony Aguirre from the University of California at Santa Cruz and his have been studying what kinds of signals would be left over from these dramatic events. Kleban found a unique signature, concentric rings where the radiation temperature would show a characteristic fluctuation. On top of the rings the radiation itself would be polarized, that is, it would oscillate in tandem in a specific direction of the sky. At least for now, no telltale rings have been found in the cosmic radiation, although the European satellite Planck promises to deliver more accurate polarization data that may shed light on the issue." Phew! Perhaps, all of this can be summed up by a scene from Annie Hall, when a young Alvy discovers the universe is expanding and he is paralyzed. Alvy's mom says "You're here in Brooklyn! Brooklyn is not expanding!" Alvy's doctor says: "It won't be expanding for billions of years yet, Alvy. And we've gotta try to enjoy ourselves while we're here!"